I knew how to call Kyndra de St. Aubin before I knew exactly why I wanted to call her. A public relations contact from Fox Sports North had pitched the idea of an interview with de St. Aubin, a former Gophers women’s soccer player who was part of the Fox broadcast team during the Women’s World Cup. I started tracking back and figured out that her name didn’t sound familiar because it’s her married name. When she played for the Gophers and at Stillwater High before that, she was Kyndra Hesse. (She married Bobby de St. Aubin, a noted soccer player himself, and her high school sweetheart since the 9th grade). Kyndra Hesse was a name I definitely recognized. In fact, she was the subject of one of the earliest stories I ever wrote at the Star Tribune, back in September of 1998 when I was here on a six-month temporary job. Nearly 17 years later, we spoke again Tuesday — about 24 hours before she did the color commentary on the dramatic and heartbreaking 2-1 Japan victory over England, in which the losing side fell on a stoppage time own goal. As it turns out, we have a lot in common these days. First, or course, she’s in the media — having fallen in love with the business on a whim in college and stuck with it ever since. 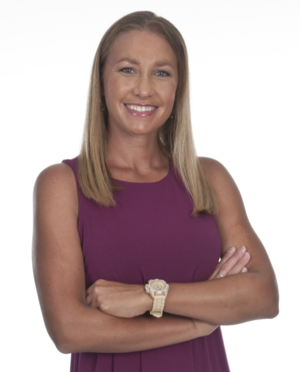 She landed a sports radio job with ESPN’s local station in Wisconsin after graduation, which led to a radio job in Phoenix as well as some work with the Big Ten and Pac-12 Network doing soccer. That helped pave the way for more soccer assignments and the much larger stage this year with the World Cup. Whatever she did, it worked. She was supposed to be done after the quarterfinals, but on merit she earned analyst duties Wednesday as well. It was a professional high for de St. Aubin, though it was also a personal challenge since it meant more time away from her 16-month-old daughter, Adelynne. It’s the first child for Kyndra and Bobby, so naturally we had to talk for a while about parenthood with our daughters (mine, Anabel, is 15 months) so close in age. And she’s done it all while managing a serious medical condition. Part of the story I wrote way back in 1998 had to do with how de St. Aubin, one of the top soccer players in the state, had recently been diagnosed with systemic lupus. I shared with her my multiple sclerosis diagnosis from 2014 — the conditions are different, but they are both autoimmune disorders — and we both agreed that the biggest impact is on a person’s life perspective. De St. Aubin said she had one flareup in 2008 that impacted her kidneys and took a while to clear up. Both of us, however, have been fairly fortunate in the big picture — though obviously she’s been dealing with lupus for far longer than I’ve been dealing with MS.
And I was lucky I decided to call. Half a lifetime later, it was nice to catch up.